Hoje passei por um erro ao tentar atualizar a versão do SharePoint da máquina. Estava instalado o SharePoint Foundation e foi instalado o SharePoint Server 2010. An exception of type Microsoft.SharePoint.Upgrade.SPUpgradeException was thrown. Additional exception information: Exception of type Microsoft.SharePoint.Upgrade.SPUpgrade was thrown. 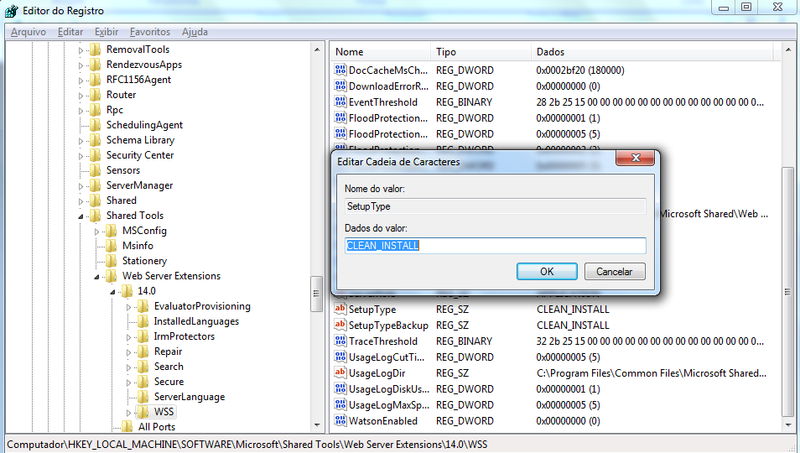 Abra o Regedit, vá em HKLM\Software\Microsoft\Shared Tools\Web Server Extensions\14.0\WSS e altere a chave SetupType de SKU2SKU_UPGRADE para CLEAN_INSTALL. An exception of type Microsoft.SharePoint.Upgrade.SPUpgradeException was thrown. Additional exception information: Failed to call GetTypes on assembly Microsoft.Office.Server.Search, Version=14.0.0.0, Culture=neutral, PublicKeyToken=71e9bce111e9429c. Could not load file or assembly ‘System.Web.DataVisualization, Version=3.5.0.0, Culture=neutral, PublicKeyToken=31bf3856ad364e35’ or one of its dependencies. The system cannot find the file specified. Microsoft.SharePoint.Upgrade.SPUpgradeException: Failed to call GetTypes on assembly Microsoft.Office.Server.Search, Version=14.0.0.0, Culture=neutral, PublicKeyToken=71e9bce111e9429c. Could not load file or assembly ‘System.Web.DataVisualization, Version=3.5.0.0, Culture=neutral, PublicKeyToken=31bf3856ad364e35’ or one of its dependencies. The system cannot find the file specified. Isso significa que o MS Charts não está instalado em sua máquina e é necessário. Para instalá-lo, baixe aqui: http://www.microsoft.com/downloads/en/details.aspx?familyid=130F7986-BF49-4FE5-9CA8-910AE6EA442C&displaylang=en. Depois de instalado, rode o Configuration Wizard novamente e Voilá!